There are several considerations while building a technology platform for call center. Telecom in general and telephony in particular are migrating to VoIP. Asterisk being the dominant hybrid PBX, provides an excellent telephony platform for call centers, with its seamless interface to both TDM (PRI T1/E1) and VoIP (SIP/IAX/H323). The sheer number of applications available within Asterisk makes is the overwhelming choice for both TDM and VoIP telephony (switch) platform. With Asterisk as the telephony switch, contact centers will still require a feature rich call center software ACD that can satisfy all the functional requirements, out of the box. The ACD has to be scale to grow with the call center. Q-Suite is an ideal ACD for call centers using Asterisk as PBX. Scaling is an important consideration in the selection of contact center technology platform to accommodate on going growth in call centers. Asterisk runs on x86 hardware and the processing power is limited by the motherboard and its CPU. This will impose an upper limit on the number concurrent calls that can be processed by the CPU. Requirements like voice recording and transcoding consume CPU power as well. Therefore the call center solution should be scalable to multiple Asterisk servers. 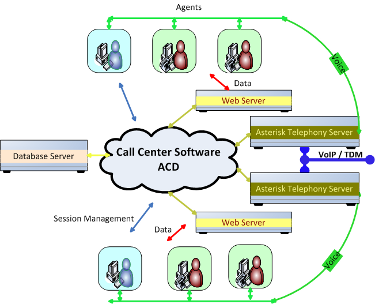 ACD within the contact center software should be able to handle multiple Asterisk telephony servers to accommodate larger inbound call handling capacity. Q-Suite ACD design will scale to multiple Asterisk servers with growth. Indosoft call center ACD software Q-Suite can provide redundant, high availability setup for call centers. It offers call recovery for single point of failures. Q-Suite comes with a Socket and .NET API to allow CTI integration to existing applications. Q-Suite call center ACD makes it a lot simpler to migrate to Asterisk as a telephony platform. If you are looking for call centre ACD software for setting up an Asterisk based contact center, look no further than Q-Suite. The effectiveness of Q-Suite based contact center technology platform using Asterisk will become obvious when you look at the features, ease of setup, and the value for money. Q-Suite is a multi-tenant, call center software with an ACD which can scale to multiple Asterisk servers. Redundant Q-Suite ACD setup has built in call recovery fail-over mechanism to protect on-going and future calls from single point of failure. This call center software offers almost all important features that you require for your contact center, right 'out of the box'. It provides customizable Web interface for Agent as well a good .NET based API for embedding and integrating the CTI to your custom applications and CRM. It comes with a sophisticated ACD capable of queue prioritization and skills based routing . The contact center agents can work in blended mode on both inbound services and outbound calling campaigns. The Script building tool within the call center software is powerful enough to satisfy the requirements of most inbound and outbound contact centers. The script builder comes with an array of drag and drop tools to develop powerful scripts that will fulfill requirements ofmeet the demands of most sophisticated script building requirements. Cradle to grave reporting is an intrinsic component of the call center software CDR. There are detailed reporting for Agent productivity, Queue and Agent Statistics, Performance reporting, Wallboards and other necessary metrics to manage the operations of your contact center. Voice recording and Listening are built into the standard feature set of the call center software. A Multi-tenant call center software permits segregation of different contact center tenants into separate partitions. This feature is especially useful for hosted providers of contact center service. The Indosoft call center software Q-Suite and the Indosoft PBX iHostPBX are both multi-tenant enabled software capable of scaling to multiple Asterisk. The super-user has the ability to setup and allocate trunks that each tenant can use. All the customizations are available to the tenant. Within each tenant there are various privilege levels to allow the tenant to effectively manage the contact center operations. A single tenant can run multiple contact center operations. Automatic Call Distribution (ACD) refers to the ability of the call center software to manage, route and handle interactions. The Q-Suite provides one of the finest ACD for any call center software and is specifically designed to run on Asterisk. The ACD comes with a powerful Dialplan builder for creating sophisticated IVR (Interactive Voice Response). Every call routed to an agent will have detailed call pop-up with DID/DNIS, campaign and Queue information. The ACD is linked to the scripts allowing not only the pop-up of the call and queue detail but also the relevant script including web applications and CRM. Q-suite offers comes with a socket library to allow eas integration of your existing custom CRM or application to the call center software and its database. If you are looking to migrate your vertical application to Asterisk and need a powerful CTI engine with a fully developed ACD, the Q-Suite socket API will provide all the hooks and interface to this powerful call center software. Q-Suite offers an extremely proficient dialer available within its call center software suite for Asterisk. Predictive, Preview and Agent ready dialer modes are concurrently available within the call center software solution. The Predictive dialer is self-pacing and compliant to FCC regulations. Indosoft call center software offers detailed cradle to grave reporting for both inbound and outbound contact center operations. These reports cover every aspect of the contact center operations. Agent performance, lead performance, queue performance and media cost performance can be easy monitored. A detailed CDR reporting is also generated by the call center software. Within the call center software, you will find one of the most powerful web based script builder available for contact center solutions on Asterisk. This script builder tool is an invaluable tool in developing scripts, integrating web applications and creating custom variables for your outbound campaign or inbound services. With ability to create multiple script pages, it is possible to have surveys and scripts with branching to the different pages. Simple applications like 'Help Desk' or 'Trouble Ticket' are easy to create and integrate into the call center software. You can embedd your Web pages and applications with the script with a click of a button. Dialplan builder is a GUI tool to develop IVR and call routing in Asterisk from within the call center software. It is an extremely powerful tool to develop call flow. It has an elaborate set of functions to process an incoming call and decide its routing and managements. The iHostPBX by Indosoft is a complete GUI to setup, manage and run your phone system. Built upon Asterisk PBX, it can handle your requirements,whether you are a small or large premise based organization looking for a stable sophisticated phone switch or a service provider offering multi-tenant hosted service. A key ingredient to any good phone system regardless of your industry domain or size, has to be able to grow, adapt, and change with the increasing demands and requirements. The iHostPBX not only meets those demands head on buit will exceed them by provide your organization with the savings, flexibility and freedom to take them to the next level.